Otherwise known as NoCrew's very belated apology for the Ego demo! swimming expeditions off the Polish coast! started to run, but then froze straight away. The best way of describing the overall Stocasto experience is "Oldskool 3D". character  through a huge megademo menu opening doors to different  screens! we're getting a full-on DSP screen buster of lovely 3D stuffs! processor, but in this case, the processor happens to be the DSP! dot screenfill goes on in the background. 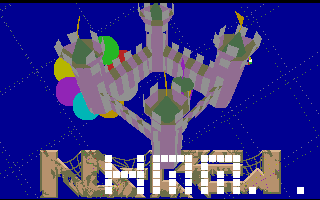 balloon, and the best of all, a mediaval castle. No it's not the 'Hmmm' demo, ignore that scrolltext! climax for a much bigger demo. Then  there is the scrolltext. This is the other way of watching this demo. Aggression 15th anniversary demo done! by this sharp burst of oldschool artistry with a modern DSP-powered twist! Sound:- 70% - Pretty average amigastyle chippy mod, but fits the demo well. Coding:- 95% - 50fps on standard Falcon, best flatshaded 3D routines ever! Overall:- 85% - A superb oldschool Falcon intro.